February is the month of "Love"
And this little one couldn't have said it any better. Hoping you all felt the "love" this month! Thanks to my friend JoAnn, I get to remove this one from my list of PIGS (projects in grocery sacks). 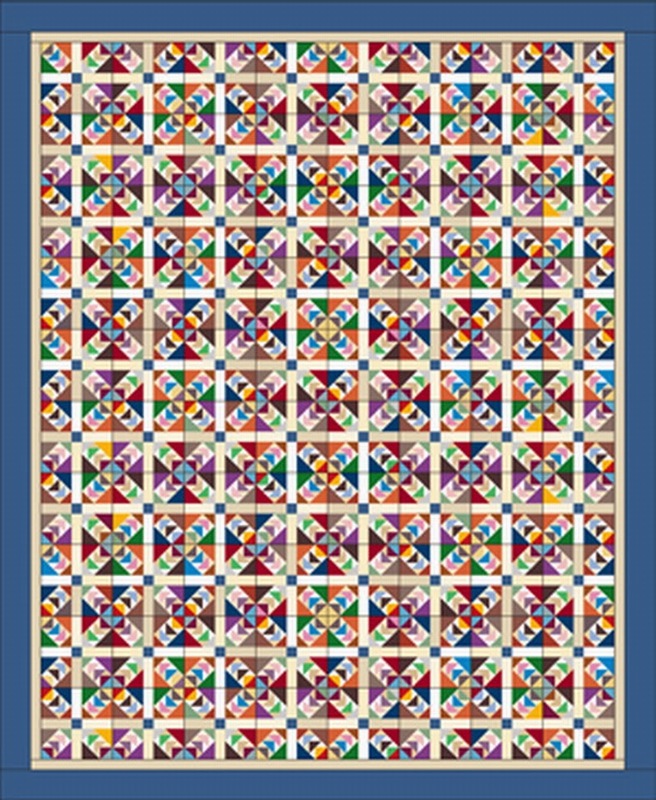 This quilt has been pieced for years, but somehow, never made it to the long arm. A few years back, I talked my friend JoAnn, into taking my old HQ frame. The very first one that came out for home machine quilters. That one you taped down to a table top and set your domestic sewing machine on. I was so captivated with it at the time... but the frame was not very sturdy and was less that great to work with. JoAnn had an interest in quilting, but wasn't quite sure...after playing on it a bit, her hubby worked over the frame and made it stronger, but she soon grew out of it. Now 4 machines later for her... (it's not my fault JoAnn), she is a fabulous free motion quilter. I have never really navigated out of pantographs on my longarm, so yes, I can say I'm a little jealous! I love the flowers with the cross hatching in the centers. And all those fun little pebbles! All topped off with these cool funky feathers in the border. You can see just why, I jumped at the chance when she was looking for a quilt to practice on. LOL!! So JoAnn, if your reading this...I've got more on my list of things to do! A few years ago, I taught a class for this quilt. Stephanie was one of the gals in the class. We were co-workers at the time, then she moved away. Fast forward a couple of years, and she sends me these photos. Her talent shows thru, and her quilting looks great! I can't tell you just how thrilled I am. 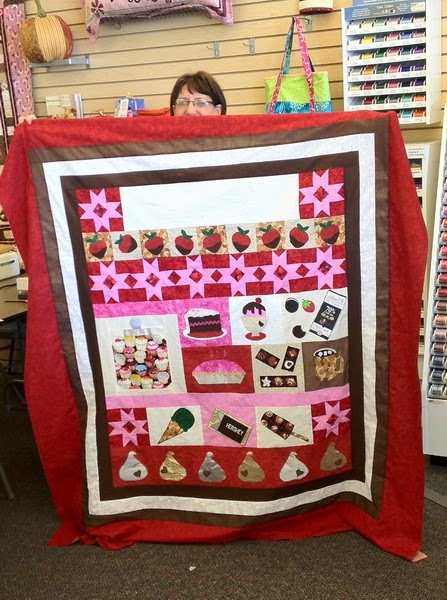 Here is Steph in class with her first Choco Bliss quilt. All pieced by the end of the classes! She is amazing that's for sure. I have a second one in my PIGS (projects in grocery sacks) pile. After having to empty my sewing room, I found all my little hiding places, which was a little shocking I must admit! I'm happy to report, it's all put back together and I have only a few more boxes of fabric that I need to put away. And of course the forever straightening out things! Changing up the quilts hanging, makes such a big difference. My Mardi-Gras quilt looks so good, with the paneling. International Sun Bonnet Sue found a new home too. I'm surprised at just how much exposure she has gotten. There has been a lot of traffic on Pinterest, on her lately. All I need to do is roll in my office chair and I am back in business. looking kid with a big nose! it's been fun to get back to it! There is a link on my left side bar that will give you all the information. And a big thanks to Alida for sharing these fun little patterns with us! What do you do, when your sewing room is torn up? It is finally happening. My studio is getting those badly needed repairs... but that leave me with no place to play! At least not my usual place. I've been moved to the kitchen table for the duration of those repairs! Heck no one needs to eat around here anyway! LOL! I recently saw one of my fellow bloggers, SeaSide Stitches post named "Drowning in Scraps". Well, if that don't spell out my world right now! One of her projects is this Wild and Goosey Quilt! This might just be the answer! 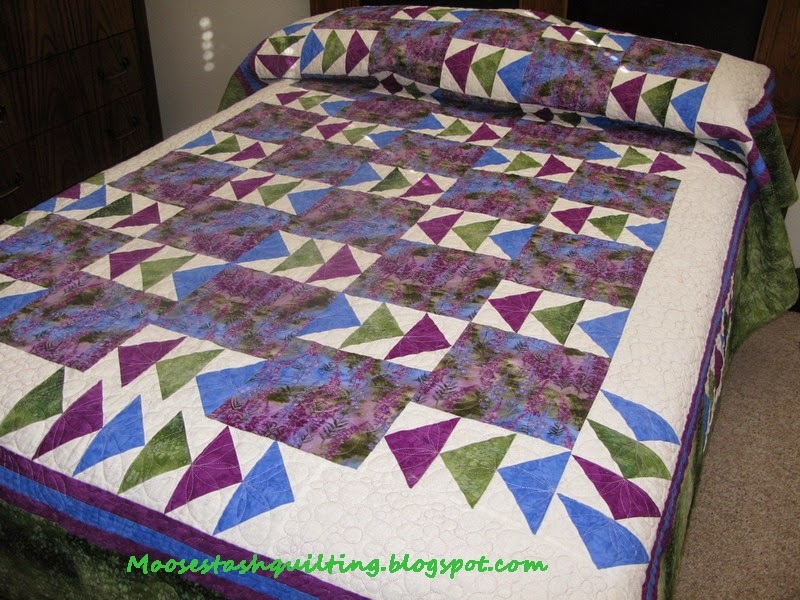 Wild and Goosey is a Bonnie Hunter quilt that was in a Quiltmaker Magazine from 2013. Whew, we need 320 of these little 3-1/2" guys! Wonder just how much scrap that will bust? Here a goosey, there a goosey...everywhere a loosey goosey! I've got a loooooong way to go! PS: The MooseStash now has it's own Facebook page! Feel free to friend us on Facebook or Like us with the links on the right hand side of my Blog! I'd love to have you join us for the adventures! When this hop was announced it just brought me right back...to remembering just how fortunate I have been. Blessed with good health, while so many others struggle. I've lost loved ones to Cancer, but not Breast Cancer. I "so" wanted to participate in this hop, but to make it really meaningful, I needed to find someone who I could support with my project. Have you ever seen so many pink moose? along with the customized hanger. What better way to make someones day! only layered over a blue instead. the best choice for quilting. I had a vision...and I'm so glad I did. cause I just love the look. Have you ever turned over your quilt and looked at the back? Does it look like some one's glaring back at you? And can you find the hidden hanger? this hop complete for me! Sending you 2...lets say "D" cups full of hugs! Thank you Pat, for being a wonderful cheerleader! Madame Samm...your our secret little treasure. Please be sure you stop by and visit my fellow bloggers today.